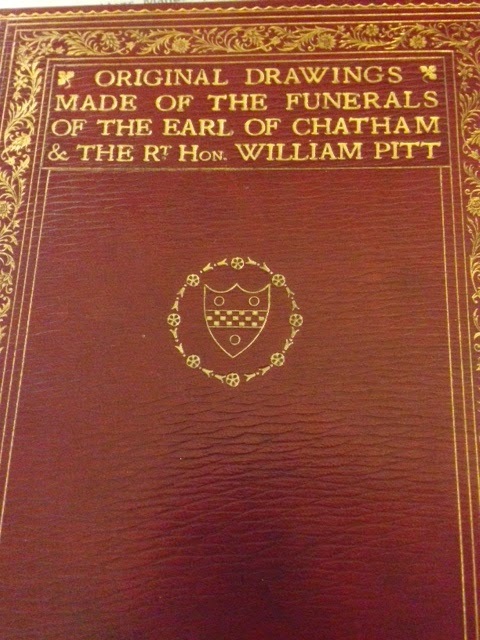 William Pitt the Elder, the 1st Earl of Chatham, died on May 11, 1778 at his house at Hayes Place in Kent. Nearly a month later, on Tuesday, June 9, 1778, his funeral took place at Westminster Abbey. 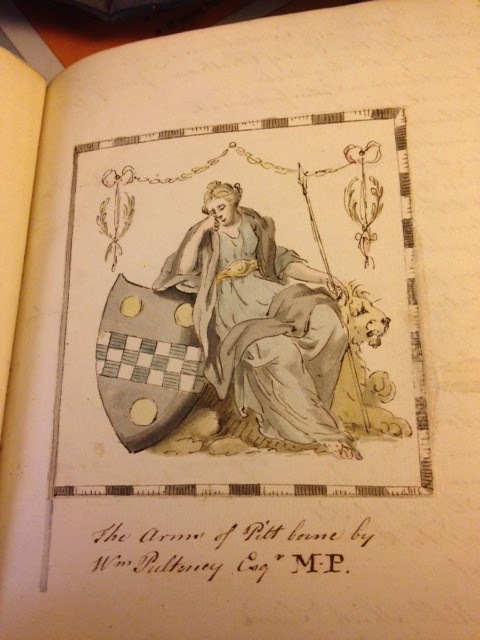 His second son William Pitt, then a young man of 19 years old, served as Chief Mourner. Young William took a primary role in arranging the funeral of his father, and he walked behind his father's coffin in the procession. 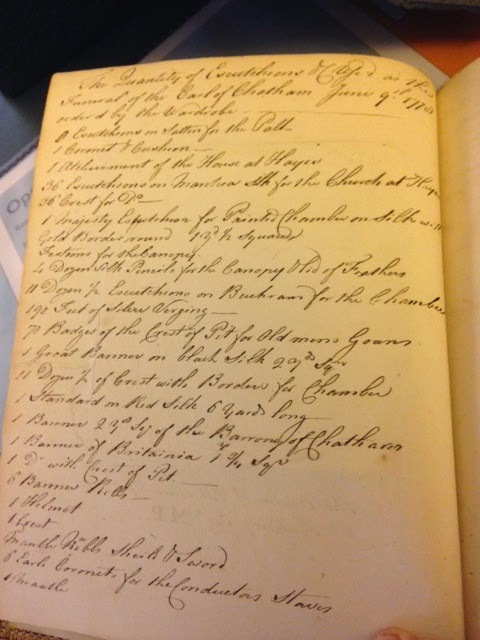 The British Library holds a detailed book of the drawings and manuscript notes made by Messrs. Bishop and Clark, "a firm who for upwards of 300 years have been connected with the organisation of State and civic ceremonials." Bishop and Clark were established in the 16th century, and their work included pageants from as far back as the reign of King Henry VIII down to the obsequies of Queen Anne, the Queen of James I, Lord Nelson, the Duke of Wellington, the playwright David Garrick, and the opening of the Royal Exchange by Queen Victoria in 1844 . 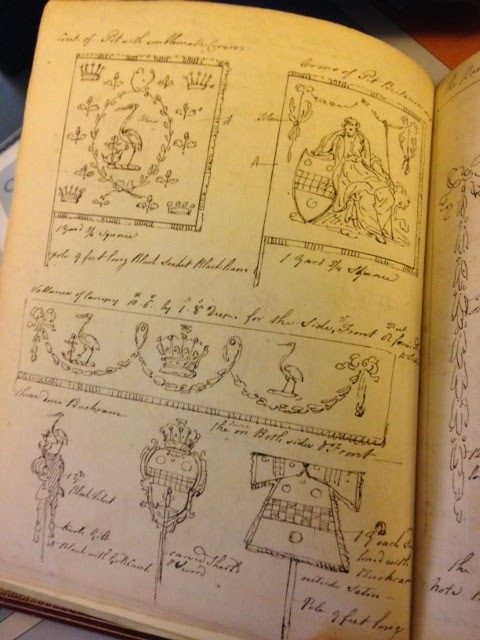 These beautifully detailed drawings preserve for posterity a sense of what it must have looked like at the Earl of Chatham's funeral in 1778, as well as Mr. Pitt's funeral procession in February 1806. 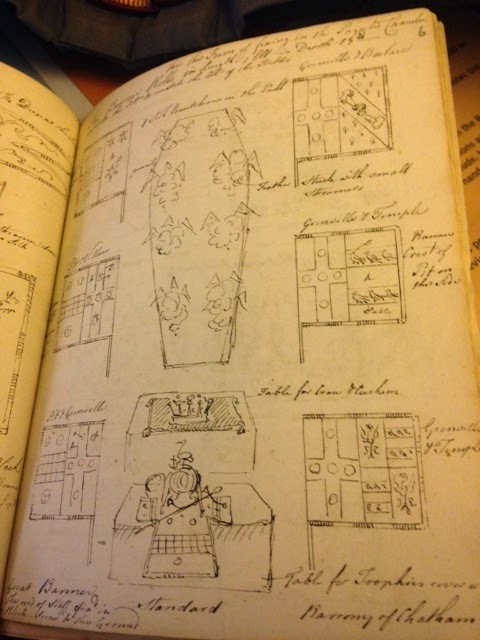 This post focuses on the Earl of Chatham's funeral in 1778, and in my next piece I will discuss Pitt's funeral drawings from 1806. 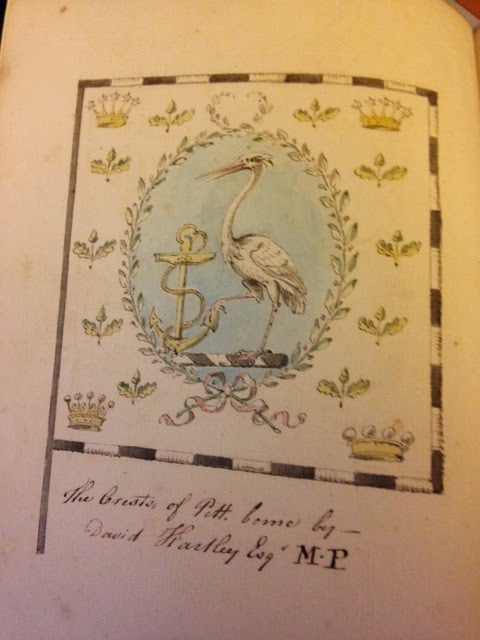 The Crests of Pitt, borne by David Hartley, Esq. M.P. 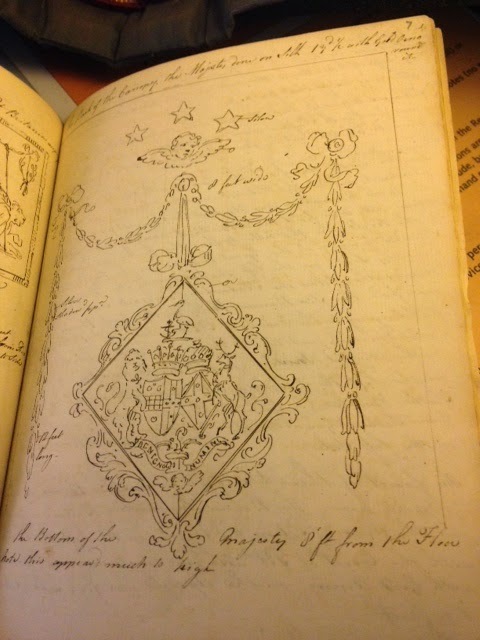 Messrs. Bishop and Clark also went into some detail when describing the quantity of escutcheons, banners, crests, and badges ordered by the Wardrobe which were used in the ceremony at Westminster Abbey . After the funeral, the Pitt family requested that these banners and escutcheons were fixed up in the Church at Hayes, St. Mary the Virgin. This duty was duly fulfilled on June 20th, 1778 by Mr. Morris, the messenger of the Wardrobe, and an undertaker . At some point in time, these arms and banners were removed. St. Mary the Virgin church underwent drastic architectural changes during the mid-19th century, and it was later hit by a bomb during the Second World War. 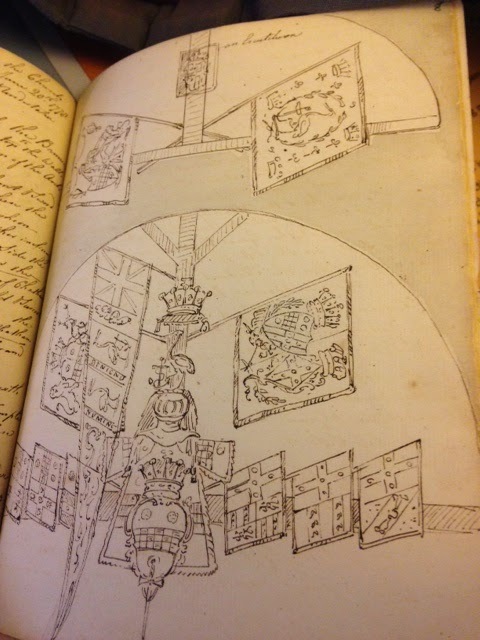 What became of the arms and banners of the Pitt family? It is a consolation to know that there is a memorial to the Earl of Chatham and William Pitt the younger inside St. Mary the Virgin Church in Hayes. As the memorial is located in the oldest surviving part of the church, there is the possibility that it could be placed at approximately the same location as the banners were so long ago. 1. Pitt funeral drawings. British Library Add MS 47896. All images shown above are taken from BL Add MS 47896.